HONG KONG – Coffee production and consumption have risen considerably over the past few decades, with 2.25 billion cups of coffee being consumed daily worldwide. But the future availability and price of coffee are going to be impacted by climate change and farmers who grow it may lose their livelihoods. Coffee is cultivated mostly in developing countries along the “Bean Belt” – which comprises around 70 countries, including Brazil, Vietnam, Colombia, Ethiopia and Indonesia. The coffee industry is worth around US$19 billion in 2015, and supports the livelihoods of 125 million people. Over 50% of global production comes from Brazil, Vietnam, and Colombia. The more prestigious Arabica coffee beans (Coffea Arabica) – grown in tropical highlands of Central and Latin America, Vietnam, Indonesia, India and East Africa – accounts for about 70% of global supply. Robusta (Coffea canephora) – grown in low-lying areas – are used in espressos and instant coffee market. Arabica performs best at 18–21°C; above 23°C, the plant grows too fast, compromising yield, aroma and flavour. Robusta is less heat-sensitive, faster to produce fruit, and more disease-resistant, although its lower quality fetches a lower price. The price of Arabica coffee beans was around US$2 per pound in 2014, nearly double the price of 2013, driven primarily by unfavourable climates in Brazil, which produces about 40% of the world’s coffee1. The southeastern state of Minas Gerais – produces about 25% of Brazil’s coffee crop – had rainfall about 10% of normal during the wet season between December and February. This was accompanied by well above-average temperatures – parts of the state’s mean maximum temperatures in January was 3–4 °C above the long-term average. In addition, a Coffee Leaf Rust (Hemileia vastatrix) devastated the crops in Central America. A prolonged drought and some unseasonably cold weather in Vietnam reduced crop forecasts for Robusta beans. Furthermore, low rainfall also hit coffee-producing areas in East Africa. In 2016, coffee prices soared as drought hit Asia including Vietnam, followed by dry weather that reduced Brazil’s Robusta crop to an 11-year low of 9.4 million metric tons, with production in Sao Gabriel da Palha declined by 30%. The three-year drought across parts of Brazil’s coffee belt have depleted stockpiles of Robusta beans, causing its domestic prices to surge by about 44%. Brazil’s instant-coffee makers, the world’s top suppliers, have stopped entering into new export contracts since September2. As coffee varieties have adapted to specific climate zones, coffee cultivation is highly sensitive to climate fluctuations. Warming and altered precipitation patterns (both heavy rains and drought) affect coffee yields, quality, pests and diseases, and are already adversely impacting on coffee farmers. A drought reduced Brazil’s coffee crop yield by one-third in 2014. In 2012, a Leaf Rust epidemic spread through Central America and into South America following unusually high temperatures and high-altitude rains. The fungus was reported in Colombian mountainous regions previously too cool for it to survive, resulted in a crop loss equivalent to $500 million and destroyed 50% of Guatemala’s coffee crop. The Coffee Berry Borer (Hypothenemus hampei), a major pest originating in Congo but now seen around the Bean Belt, causes crop damage of over US$ 500 million annually. Since 2001, the borer has spread upslope with hotter, wetter conditions in Tanzania, Uganda, and Indonesia – 300 metres higher than where it was on Mt. Kilimanjaro last century. Climate change implies that the world’s Arabica coffee-producing zones – with 25 million farmers – may suffer the most. Low latitudes and low altitudes (e.g., Mesoamerica) are most at risk, while higher altitudes and higher latitudes may experience less pronounced negative impacts. By 2050, global area suitable for coffee production may be halved, and almost 80% of land currently used to grow Arabica in parts of Brazil, Central America and Vietnam may become unsuitable. This could redistribute global coffee production areas – broadly, away from the equator and further up mountains. Coffee-dependent countries and farmers have to adapt to the changing climate. The coffee sector in Nicaragua brings in $400 million in export revenues and employs hundreds of thousands of people. Nicaragua traditionally grows Arabica, but is increasingly planting Robusta following a two-year drought and a blight that have affected most of the coffee plantations and hundreds of smaller outfits. Some producers worry that this shift could affect Arabica production and prestige. In Costa Rica, coffee is the third agricultural export and supports 40,000 families. Fruit trees e.g., plantain trees, are commonly used on coffee farms to create a microclimate for Arabica coffee plants, reduce soil erosion and improve water filtration. However, the farms need financial support as it costs about 8,000 dollars per hectare to change plant varieties, and trees can take up to three years to produce their first harvest. 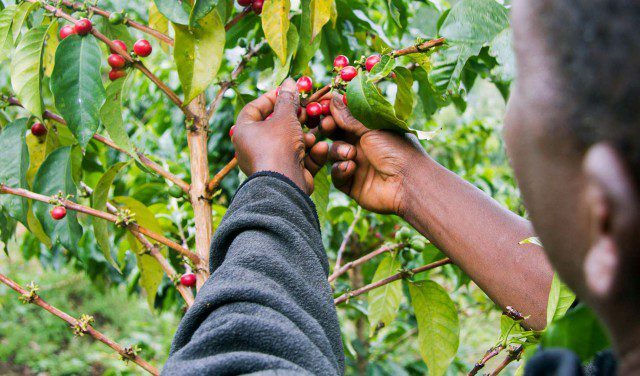 Coffee production may no longer be viable in some areas in the near future. Farmers in parts of Central America are replacing coffee trees with cocoa, and spices such as turmeric and ginger. Kreft, S. et al., Global Climate Risk Index 2017: Who Suffers Most From Extreme Weather Events? Weather-related Loss Events in 2015 and 1996 to 2015 (Bonn: Germanwatch e.V., 2017). Coffee Producers in Costa Rica Use Science to Tackle Climate Change, 2016: http://www.ipsnews.net/2016/10/coffee-producers-in-costa-rica-use-science-to-tackle-climate-change/.